Since Abeja's first release from the 2001 vintage, the winery has established itself as one of Washington’s premier producers of Cabernet Sauvignon - the 'King of Grapes.' While the winery also makes limited bottlings of Merlot, Syrah, Chardonnay, and Viognier – which are also consistently standouts that demand attention – Abeja's mission is Cabernet Sauvignon, which accounts for the majority of its production. Among the many things to look forward to following any great vintage, such as 2007, are the releases from the best wineries. While almost across-the-board high quality fruit guarantees excellent wines from numerous producers, great vintages are where the best wineries shine and create something truly special. Abeja's 2007 Cabernet Sauvignon was therefore a wine to be anticipated. Despite this - in fact because of it - the 2007 Abeja Cabernet Sauvignon is a wine worthy of both patience and anticipation. Still tightly wound, the wine shows itself slowly but powerfully with smoke, brambly berries, and bittersweet chocolate. The palate is rich and intense with layer upon layer of fruit. Drinking well now, the wine promises years of cellaring potential and is easily among the best Cabernets from the 2007 vintage. Though drinking the 2007 Abeja Cabernet Sauvignon may feel a bit like opening one of the last presents on Christmas day, fear not. 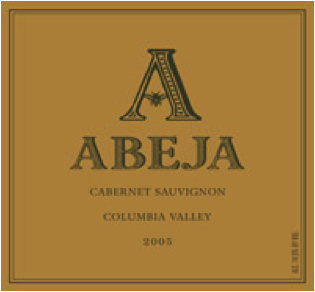 Abeja will be releasing its 2007 Reserve Cabernet this fall. Only made in select years – thus far 2002 and 2005 – this wine is 100% Cabernet made from the winery’s best barrels. A bit farther in the future, the winery will be releasing its first estate Cabernet next spring, which comes from the 2008 vintage. While Abeja has made its name with Cabernet Sauvignon, the winery also recently received high praise for its 2008 Estate Syrah in the form of a 95-point rating from Wine Spectator. This puts the winery in rare company of those from Washington with wines that have received a ‘Classic’ rating from the publication. Can a Cabernet Sauvignon focused winery remain so while showing so much success with other varietals? Time will tell, but the king should sleep lightly. Rating: * (Excellent) Very pale in color. An engaging nose with spice, hay, and freshly sliced apples. Rounded edges on a palate speckled with oak textures and crisp acidity. Finish lingers. 100% Chardonnay. Celilo, Conner Lee, Gamache, and Kestrel vineyards. Aged in French oak (50% new). 13.8% alcohol. 669 cases produced. Rating: * (Excellent) Nose is marked by peaches, floral notes, honeysuckle, and honey. A rounded mouthfeel loaded with mineral and peaches. 100% Viognier. Mill Creek Vineyard. Aged in neutral French oak. 14.5% alcohol. 148 cases produced. Rating: * (Excellent) An appealing, aromatic nose with smoke, blueberry, and floral notes. Tart and pleasing on a fruit-filled palate. Best Syrah from the winery to date. Syrah co-fermented with 3% Viognier. Mill Creek Vineyard. Aged in French (50%), Hungarian (40%) and American oak. 14.8% alcohol. 271 cases produced. Rating: * (Excellent) An aromatic wine with baker’s chocolate, brambly berries, and streaky herbal notes. Very evenly balanced on the palate. An outrageous value. 78% Cabernet Sauvignon, 12.2% Merlot, 4.9% Cabernet Franc, and 4.9% Petit Verdot. 14.5% alcohol. 1,040 cases produced. Rating: ** (Exceptional) Blackberry, black cherry, chocolate, earth, and touches of spice on a complex, evolving nose. The palate brings rich, intense cherry fruit and chocolate. Easily among the best Cabernets the winery has ever produced. 88% Cabernet Sauvignon, 8% Merlot, and 4% Cabernet Franc. Heather Hill, Sagemoor (Bacchus and Weinbau), Hedges Estate, Blue Mountain, and Wallula vineyards. Aged in French oak (60% new). 14.9% alcohol. 2,294 cases produced. Rating: ** (Exceptional) Smoke, brambly berries, bittersweet chocolate, and high-toned floral notes. Delivers on the palate with richly flavored red and black fruit followed by a persistent finish. 82% Cabernet Sauvignon, 14% Merlot, 4% Cabernet Franc. Heather Hill, Sagemoor (Bacchus and Dionysus), Hedges Estate, Blue Mountain, and Wallula vineyards. Aged in French oak (60% new). 14.8% alcohol. 3,357 cases produced. Hi Christian, thanks for the link. Hope all is well.